Wolfsburg / Los Angeles, 16 November 2011 - At Volkswagen, the letter ‘R’ as an added identifier promises top-notch performance. Currently, this claim is being validated with turbo pressure by the Golf R with 199 kW / 270 PS of power and the Scirocco R (currently only in Europe) with 195 kW / 265 PS. In a USA premiere in Los Angeles, Volkswagen is now showing a third variation of this sporty theme: the Beetle R Concept. It is based on the 21st Century Beetle. Like its two larger siblings, the Golf R and Scirocco R, the R version of the Beetle was also created in the halls of Volkswagen subsidiary Volkswagen R GmbH. The Beetle R Concept is still a design study. Those who are familiar with the Beetle 2.0 TSI (147 kW / 200 PS) know the dynamic potential of this new car. As an ‘R’, the Beetle could demonstrate a performance potential similar to that of the Golf R and Scirocco R.
Visually, the Beetle R Concept, painted in ‘Serious Grey’, offers a glimpse of what a production version might look like. Outside, the concept is equipped with 20-inch ‘Talladega’ alloy wheels – whose styling is like that of the Golf R and Scirocco R. However, 18- and 19-inch wheels are mounted on those cars. Easy to spot on the Beetle’s wheels, which feature 5 triple spokes, are the blue brake callipers in R design. Designers completely redesigned the front and rear bumpers that were widened by 30 mm. In front, the bumper module practically consists of 3 air intakes, which are styled in contrasting ‘Black High Gloss’. The middle air intake supplies the engine with oxygen, while the outer two contribute to cooling the brakes. The front spoiler, also painted in ‘Black High Gloss’, is designed as a flat splitter (with a chrome strip); splitters of this kind are typically used in motorsport. To regulate engine temperature within an optimal range, even under extreme conditions, ventilation slots are found on the right and left sides of the engine bonnet. The rear bumper also has air exhaust slots that are integrated in the aerodynamic concept of the Beetle R Concept. There is also a diffuser that is integrated in the lower bumper area. Together with the rear spoiler – which is significantly larger than the one on Beetle production models with up to 200 PS in power – and its black trailing edge, ideal downforce values are generated at the rear axle. A visual and acoustic highlight is the exhaust system with its 2 sets of dual chrome tailpipes. On each side, the bumpers transition into the free-standing wings; they were also widened 15 mm per side. The side sills are styled in ‘Black High Gloss’; a high-end chrome trim strip is incorporated here. Also painted in ‘Black High Gloss’ are the roof, the upper part of the bootlid connecting to it, the door mirror housings and door handles. At Volkswagen, the letter “R” promises top-notch performance, a claim validated by the 266-hp Golf R and the 261-hp Scirocco R. In a world debut at the IAA in Frankfurt, Volkswagen is now showing a third variation of this sporty theme: the Beetle R Concept, based on the 21stCentury Beetle. 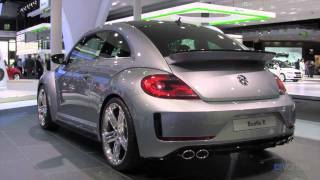 Like the Golf R and Scirocco R, the R version of the Beetle was also created at Volkswagen subsidiary Volkswagen R GmbH, located near Wolfsburg.